Our range stunning Debuchy Football Tables are sure to be a centrepiece in any setting due to their striking design. Lowest prices, includes free delivery and installation. Debuchy Football Tables are designed and built to the highest standards by renowned football table manufacturer Toulet. With commercial grade components such as sturdy metal legs, toughened glass and chromed aluminium players, these tables are beautiful yet sturdy, giving you a piece of furniture and a design statement that will last. Designed in collaboration with French footballer Mathieu Debuchy, the Debuchy by Toulet range has taken the art of bespoke custom tables to a new level, offering a unique approach to giving clients a vast array of choices in creating a unique Foosball that is suited perfectly to their personality, their football team or their interior. Debuchy tables offer players which are taller than most, allowing you to use their heads as well as feet for more inventive play, and when combined with the innovative aesthetics you'll find that Debuchy tables are striking and individual, without ever compromising on play quality. Debuchy tables are intended to be fully customisable, an ethos which is exemplified in the T22 table. With over 500 unique colour combinations and the choice of luxury finishes, LED lighting and bespoke logos, this amazing table will make sure you stand out from the crowd with a personalised games room. All Debuchy tables can be fitted with a variety of handles and lighting options, meaning you can create the table of your imagination with the greatest of ease. Choose from the pre-existing options, or specify your own colour from the extensive RAL range to get the exact look you want. These amazing Debuchy tables are made in France and fully endorsed by Mathieu Debuchy, representing innovation and creativity by design. From the simple, elegant lines of the T11 to the automobile-inspired details of the Le Debuch, the attention to style and creativity is present in every part of these tables. 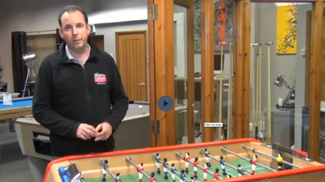 If you like the look of these foosball tables, but can’t decide on a model, give our friendly team a call to talk through your requirements and help you decide on the best table for you and your family. Free Delivery and Installation to the majority of the UK Mainland is included. The table will be professionally handled by one of our fully insured specialist two man delivery teams. It will be placed in a ground floor room of your choice, and all packaging removed. However, for locations further afield there may be an additional charge depending upon your exact location. Please call our friendly customer service team on 0800 622 6464 for a quote.